Home page > Blogs > Quarto Homes > Pets & Animals > DIY Dog Grooming: What Brush Should I Use For My Dog? DIY Dog Grooming: What Brush Should I Use For My Dog? In an ideal world, given the right information and experience, nobody would be able to groom your dog better than you. There will always be benefits to taking your dog to a professional groomer, but no matter how professional and caring your groomer is, he or she will never share that same special bond that you do with your best friend—your dog. That’s where DIY Dog Grooming: From Puppy Cuts to Best in Show by author and professional pet groomer Jorge Bendersky comes in. This is not only a book about saving money, but it’s also a book that will improve both your and your dog’s quality of life. Taking the time and effort to learn how to groom your dog is a beautiful learning experience that will teach you new and wonderful things about your dog, and you will discover that the more you learn about your dog, the better dog owner you will become. Your dog loves and trusts you more than anyone else and will appreciate being groomed by you more than by someone else. So let’s begin by taking a look at the main staple in DIY dog grooming toolkit: the brush. What kind should you use? What’s the difference between smoothing fur and caring for mats in your dog’s coat? Jorge walks readers through each type of dog brush (and comb) and explains how to use it. With so many brushes on the market, one can easily get the impression that you have to purchase many different brushes to do a proper grooming, when in fact, the key is to choose the right brush for each purpose. Specific brushes are used before, during, and after the bath. It is a good idea to have one brush to use when the dog is dirty and matted and a second brush to use when the dog is clean. I recommend using less expensive brushes for prep work (before bathing) and a better brush or set of brushes for working on clean hair. This will not only extend your “finishing” tools’ life span, but also save you time from having to disinfect and wash the brushes you used to brush out mud when it is time to get busy on the grooming task. You can clean and disinfect later. Your dog will appreciate these time-saving techniques and, more importantly, being able to complete the grooming more quickly will be safer for your dog because he will spend less time on the grooming table or surface. The slicker brush is the one-size-fits-all brush. Slicker brushes are usually rectangular. They have a solid base with a soft rubber insert that holds many metal bristles. This soft rubber insert allows all the bristles to bend in the same direction. The shorter the bristles, the more undercoat they will pull out because there will be more pull and less give of the hair follicles. For longer coats, a slicker brush with a softer back and longer bristles will have more “give” and flexibility, making it easier to go through a thicker or longer coat. Slicker brushes should only be used when the coat is dry, before bathing and after bathing when the hair has been towel dried and you are brushing the dog while using the hair dryer. Using the slicker brush on wet hair could scratch the skin. Dog hair is elastic when damp, so you have to be especially careful when using any tools on your dog while the hair is wet. The proper way to hold a slicker brush is to pinch the brush handle using your thumb and middle finger. Placing your index finger on the top portion of the handle, where the brush weight is evenly distributed, allows you to regulate the pressure you apply to the different parts of the body. Gripping the brush too tightly will cause you to lose sensitivity and control of the brush. Maintain brush control with careful wrist movements and index finger pressure. The best way to achieve a great result is to brush your dog section by section, making sure the section you are working on is totally brushed and dry before moving to the next section. The width of each section should be the same as the width of your brush or comb. For maximum fluff, always stroke with the brush under the warm air of a dryer. Using the slicker brush before the bath will help to separate the hair, making it easy for the shampoo to penetrate all the way down to the skin where it will most effectively clean the skin and coat. On areas where the skin is loose, it is recommended to use your free hand to softly stretch the skin, running the brush line by line; this process is called line-brushing. On long-haired dogs, a slicker brush will help to remove mats, will loosen dead undercoat, and will remove dead skin cells while promoting strong and healthy skin circulation and strengthening the hair follicles. On curly or fluffy coats (poodle, chow chow, and Pomeranian), brushing against the hair growth will emphasize the dog’s natural volume. On dogs with medium-length hair, a slicker brush will remove the dead undercoat, reinforce the skin’s blood circulation, and strengthen the hair follicles to reduce shedding. When used after the bath, a slicker brush will give the coat a shiny finish. Pin brushes come in many shapes and sizes with a wide range of pin lengths and pin flexibilities. They perform the best on coats in good condition that are already free of mats. The softer the base of the pin brush, the more flexible the brush will be. Dogs with heavier or thicker undercoat will benefit from firmer brushes to make sure every hair is lifted and fluffed to perfection. On dogs with a drop coat, using a pin brush will result in a perfectly smooth look. Although this brush is not commonly used, it is a good tool to give short-haired dogs a shiny finish and to remove dandruff and loose hair. It is a good training brush because dogs feel like they are getting a massage when this brush is used. This brush will probably be your dog’s favorite because he will feel like he is getting a finger massage. This tool is perfect to use in the tub while bathing dogs with short and medium coats. This brush is also useful for short-haired dogs that shed. It easily lifts and removes dead hair, and the dogs love their massage. There is nothing better than a good soft brush to deeply clean your dog. It is important to remember that dirt and debris get caught on paws, under the nails, and in the thin skin between the pads. A natural, soft nailbrush or even a veggie brush is useful to be sure our friend’s paws get perfectly clean. I love to use a good brush on the body of short- and medium-haired dogs to really get the skin clean and remove dead skin cells. A small enough brush will even help remove tearstains and mouth stains. A rake is a tool with a handle and a wide head containing one or more rows of rigid, rounded teeth (usually widely spaced) designed to remove dead undercoat on dogs with medium- to long-length hair and a thick undercoat. Select a rake whose pins are approximately the same length as the dog’s coat to be sure it penetrates enough to open and remove the undercoat but not long enough to risk scratching your dog’s skin. Use small strokes at the beginning while holding the dog’s skin taut. As the undercoat starts to loosen, make longer strokes with the undercoat rake, always being aware of how deep you are going to avoid scratching the dog’s skin. After the undercoat feels loose, use a slicker brush to remove the loose coat. This small tool with a handle and one or more rows of sharp-bladed teeth, when used properly and with extreme caution, is a great tool to help break severe mats. Using small strokes, apply directly on mats to open or loosen them before using a slicker brush. It must be used very carefully because the blades are sharp and can easily cut your dog’s ears, tail, or loose skin. Always hold the mat with your fingers next to the skin to avoid unnecessary pulling and to protect the skin. Start by opening the mat from the outer edge, moving slowly into the middle of the mat. Avoid using mat-breaking rakes on the ear flaps and on the tail because these can easily get in contact with the blades. This is a tool with a handle and a serrated blade at the end. These blades are good to remove the top layer of dead coat on medium-haired breeds such as German shepherds or golden retrievers. By running it on top of the coat, always following the direction the coat grows, the teeth will grab and pull the undercoat. This tool should be used very carefully to avoid hurting the dog’s skin, especially while raking the edges and sensitive areas of the dog. The stripping knife is a grooming tool with a handle and a small metal finely serrated blade specifically designed for dogs that need to be hand-stripped. Hand-stripping is a grooming technique that pulls the dead hair from dogs with wiry coats, usually terriers. When used properly, with the correct hand motion and application of pressure, it will remove the dead coat and excess undercoat. The hair must be pulled in the direction of the hair growth. While holding the skin taut with one hand, grab a few hairs between the blade and the thumb of your other hand. Keeping your wrist straight, move the arm that’s pulling the hair out and away from the skin. Rolling or twisting your wrist will make this technique uncomfortable for the dog. You also can perform this technique without the stripping knife, by just using your fingers to neaten the appearance of the dog. A stripping knife can be used to finish sporting-style haircuts by running the stripping blade from head to tail along the dog’s back to erase clipper marks and give a natural finished look. This is the best tool to use when searching for fleas and ticks. For the novice groomer, plastic flea combs are the best because of their flexibility. They are also the safest ones to use when working around the face to remove any dry discharge around the eyes. Before using these combs to remove goop around the eyes, first soak the area in diluted tearless shampoo, being careful not to allow shampoo to drip into the eyes. Flea combs should only be run through a previously de-matted coat. Stainless steel–toothed combs are the best, most durable, and easiest to clean and disinfect. They come in a wide selection of shapes and even colors. Fine- and medium-tooth steel combs are about 7½ inches (19.1 cm) long and are versatile enough for use on most breeds. Combs that have smaller and tighter tooth separation are better suited for faces and topknots. Combs with wider tooth separation are best suited for the body. Rat-tail combs are especially good to finish up faces and make the perfect ponytail. Be sure to choose one with rounded teeth to avoid any possibility of hurting your dog. The metal tail part of the comb can be used to slowly open up mats. You can often tell how healthy a dog is by the appearance of its coat. Grooming your dog regularly offers clues to her health: It nips potential health problems, like allergies, poor nutrition, parasites, or diseases, in the bud–or at least gives you some early warning about them. Grooming also makes your dog (and you) comfortable socializing whilst also stopping the spread of dirt, fleas, and germs. You can conveniently groom your dog in the comfort of your home. But perhaps the biggest benefit to grooming your dog yourself is strengthening your bond with them. DIY Dog Grooming, From Puppy Cuts to Best in Show by Jorge Bendersky, and foreword by Cesar Milan, will show you how to take the best care of your dog, regardless of breed, temperament, or age. Practical step-by-step photos will take you through everything you need to know to bathe and trim your dogs, plus care for their nails, ears, teeth, and more. Learn how to train them to relax and enjoy grooming. Simple, step-by-step instructions for everything from bathing to brushing. Practical solutions to common problems like fleas and ticks, dirt and mud. Creative suggestions for grooming a picture-perfect dog. 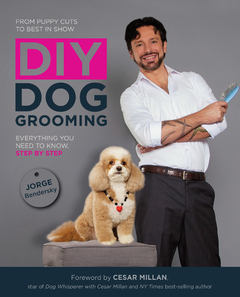 About the Author: Jorge Bendersky is a celebrity dog groomer in New York City. He grooms Manhattan area dogs and consults on dog grooming. He has been a contestant on the Animal Planet show Groomer Has It, a judge on TLC’s Extreme Poodles, and an expert on Animal Planet’s Dogs 101. He has also appeared on The Today Show, ABC Nightline, CW11, and E! News, and in the New York Post, the New York Daily News, the Chicago Tribune, and more. Learn more about Jorge at www.planetjorge.com.